* 20mm 레일에 탑재하여 수직손잡이로 사용할 수 있는 택티컬타입 메탈 CQB 포어그립입니다. 겸용하여 사용할 수 있는 수직손잡이입니다. 부위에 건오일 등을 도포하여 조여주시는 것이 좋습니다. ==>> 킹암스사 제공 이미지 상세 보기 : "클릭"
into two sizes. The storage compartment is capable to store up to 2 CR123A batteries. 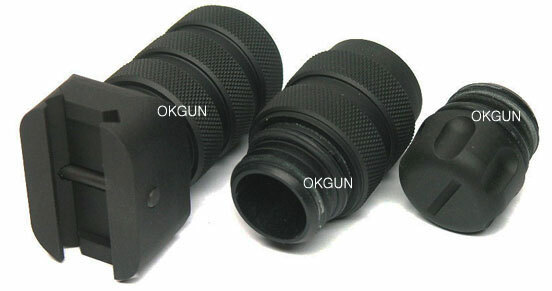 Suitable for standard 20mm rail.